You love your brick house, so why wouldn't you want it to be looking like new? Brick has been a popular choice for generations because of its rich, timeless look. Over years though, dirt, grime, and even moss can cause discoloration and make your home's exterior unsightly. Luckily, a pressure washer can restore your brick to its former glory. Following these steps below will have that old brick looking new once again. At least a week before you clean, the first thing you'll need to do is patch any damaged mortar joints between the bricks and let it harden for at least 7 days. This will prevent water from seeping behind the brick and causing mold to form in your walls. We know this will be difficult, especially since your mind is on pressure washing, but it's very important to maintain the structural integrity of the brick and mortar. Pay for your pressure washer by check, receive an additional discount for doing so, and wait a little longer for it to arrive. That'll give you time to patch the mortar and let it set in place. Thoroughly soak the surface of your home. It's important to do this step prior to applying any detergents as it will prepare the brick for cleaning. *Pro Tip: To ensure an even soaking, spray water from the bottom to the top of your house. This bottom-up motion will help to evenly soak all surfaces without it running down in uneven streams. Make sure you choose a detergent designed for cleaning brick or exterior siding. Using the incorrect kind of detergent can cause dirt to stick to your mortar. Now apply the detergent to the brick, spraying from the bottom up. Allow it to work into the brick for 5-10 minutes. The key to cleaning brick is less pressure, more detergent. Bricks and mortar are porous, so the detergent and water will soak in a bit. Giving it plenty of detergent and water will help cover all areas where dirt may reach. Let the soap do its job, loosening and moving the dirt out of the brick. This will make it cleaner and brighter. For extremely dirty and stained looking brick, use a rotary scrub brush. This is a less abrasive technique than using water at high pressure. It'll help work the detergent into the brick, and break up tough stains. 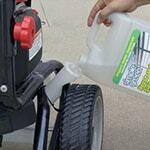 Grease, grass stains around the foundation where you mow, moss, and even tree sap are difficult to remove. Scrubbing these kinds of stuck-on messes with a quality brick and mortar detergent can help to break up and loosen them. Once the detergent has sat and had time to work itself into the brick, switch to a delicate spray pattern. It's very important that you use a delicate pattern because using too much pressure can and will damage the brick. 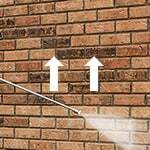 Unlike before, to wet the brick, spray from top to bottom to remove the detergent and residue. Move slowly, but keep it moving. Don't hold the pressure washer in one spot. Move in a circular motion over tough stains, and continue moving from top to bottom in mostly sweeping motions to evenly remove dirt. Once the brick is clean and dry, the last step is to apply an approved brick and mortar sealant. This will help keep your bricks clean longer. It's like getting the wax and seal coat on your vehicle when you take it through the car wash. It helps protect it and keep it looking nicer longer. The sealant will help prevent acids, oils, greases, and other harmful substances from penetrating the surface. They leave the brick and mortar looking as though nothing's been applied, but when water or other kinds of liquids get on it, they bead up and run off.